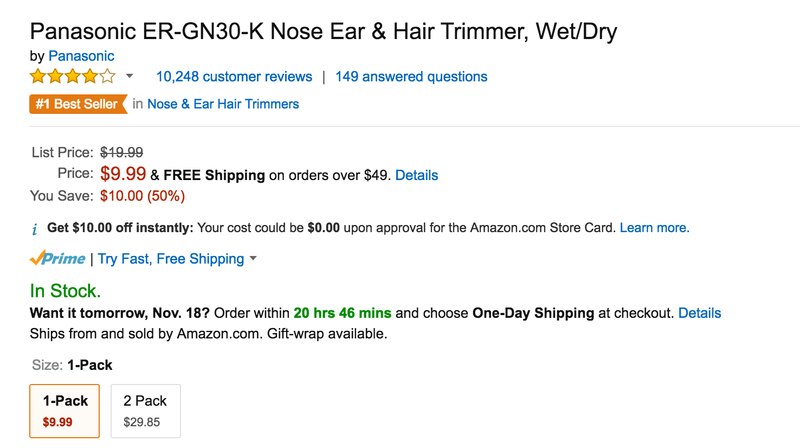 Amazon is once again offering the Panasonic Nose Ear Hair Trimmer (ER-GN30-K) for $9.99 with free shipping for Prime members or in orders over $49. This same deal can be had over at Best Buy. That’s about 50% below the original listing, within $1 of the lowest we have tracked and the best we can find. It is the very best selling trimmer of its kind on Amazon and has a 4+ star rating from nearly 10,000 customers. An immersible Panasonic Vortex Cleaning System draws in water from all sides and spins through the trimmer for easy nasal hair trimmer cleaning in seconds. Wet/dry convenient nosehair trimmer, easily and comfortably trims in the shower or trims dry anytime, anywhere. Lightweight and compact nose and ear clipper design, fully powered with one AA-size battery, includes protective nose trimmer cap and cleaning brush for quick maintenance. The Panasonic ER-GN30-K nose hair trimmer for men makes it quick, clean and easy to trim nose and ear hair, detail eyebrows and detail mustaches and beards. It also removes facial and body hairs, making it a great nose hair trimmer for women. This top rated nose hair trimmer uses a safe, rotary nasal hair cutting system to eliminate the risk of injury caused by using scissors as a nose and ear clipper. Its ultra-sharp, hypoallergenic dual-edge blades are uniquely curved to draw in nose and ear hair from top and sides for efficient trimming, and leave the proper amount of hairs for natural filtering. And its waterproof, wet/dry personal groomer convenience lets you comfortably use this Panasonic trimmer in the shower or dry anytime.